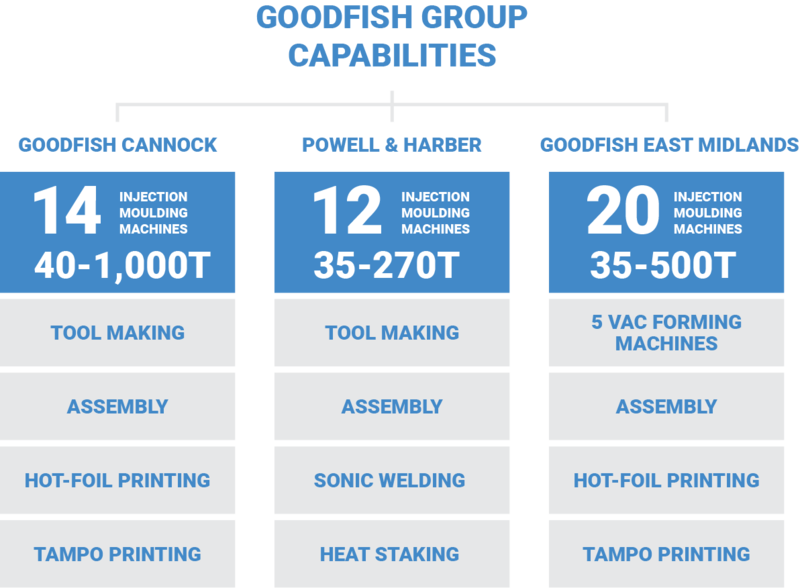 Because Goodfish continually invest in equipment, automation and innovation our factories stand out from the crowd. Our customers tell us our operations clearly reflect this investment in terms of the range, quality and youth of our machinery, as well as the bright, tidy, clean facilities in which our equipment is housed. We have our own tool-rooms with the latest CNC, EDM and wire-eroding equipment and long-serving, highly-skilled tool-makers. We also have in-house prototyping, printing and assembly skills. We have heat-staking in-house and we send parts out to our key suppliers for EMI shielding coating. Our metrology departments are equipped for fast, accurate, repeating measurements and we have invested in all the latest preparation ancillaries to ensure that the materials going into our machines are optimally prepared for processing.